Manual syringes are cost effective components available in sizes from 1cc to 60cc. This range is supplied pre-assembled in sealed packs. Luer lock (twist-on tip). Use with our range of dispensing tips and tip caps. Non-sterile manual syringe barrel assembly. Natural (clear) for use with all adhesives. Luer lock for twist-on attachment of needle tips or tip caps. Includes syringe barrel, plunger rod and rubber piston. 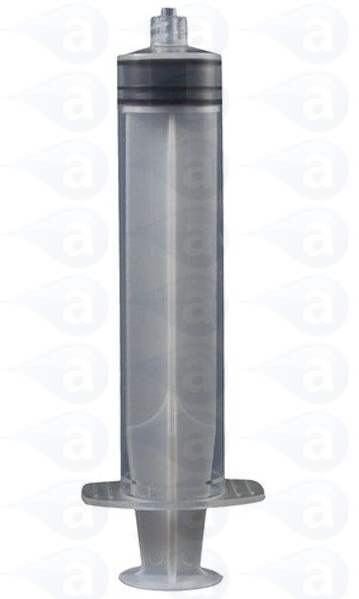 These syringes are industry compliant low friction high density polypropylene. The pistons are plasticised rubber material. The plungers are high density polyethylene. Supplied in a sealed pack of 50 syringe barrels, pistons and rods. Suited for use with many fluids, adhesives, solvents, primers, inks, paints, lubricants and activators. Clear barrel without marked graduations. Please note that these syringes use rubber wiper pistons and are therefore not recommended for use with Cyanoacrylate instant adhesives. Please use our dispensing bottles and Teflon lined tips when applying superglues or a pressure pot dispensing station. Ships direct from stock. All products shipped are in sealed boxes or packs that include label with batch codes. Summary: Dispensing syringe plastic with rubber piston supplied pre-assembled ready for use. Typical Applications:- Deposits of solder paste or solder flux, grease to bearings, potting components with epoxies, RTV to edge seams, silicone shots to bond products, gasket sealant repair, low volume aircraft maintenance work, braze pastes, glues, threadlockers, general adhesive applications.